There's no caption for this yellowing print of a lady at an office desk with postage stamps (quite possibly on October 19, 1925). Yet there must be some reason it's in the Library of Congress Prints & Photographs Online Catalog. View full size. Submitted by Zcarstvnz on Wed, 07/02/2014 - 7:25pm. I'm fairly certain the correct seal (stamp?) has not been identified. The seals on the desk in the photograph appear to lack the "Merry Christmas and Good Health" wording. There is also much more white (or light colored) area in the stamps she is utilizing than in the 1925 Christmas Seal stamp in the example below. Could this be a Wisconsin Anti-Tuberculosis Association seal or other Wisconsin related seal? It also seems very early in the year for this to be a 1925 "Christmas Seal." Weren't these actually sold starting around the middle of November and closer to when Christmas cards would be available? The availability of the 1925 national Christmas Seal stamp on October 19th seems doubtful (if that is the actual date of the photo). Submitted by E Helliwell on Thu, 06/26/2014 - 4:01pm. 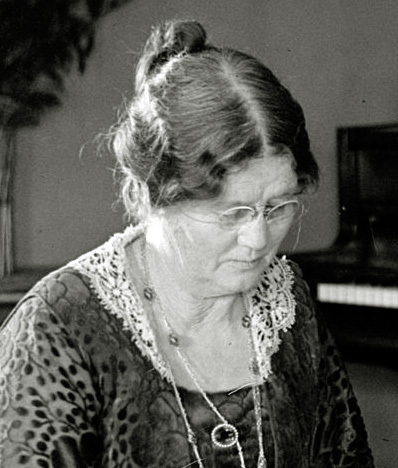 I agree with the comment about this likely being a picture of Robert M. La Follette's widow, Belle Case La Follette. An interesting feature is the framed copy of Rudyard Kipling's poem "IF" on the wall behind her. Submitted by davidk on Thu, 06/26/2014 - 8:06am. I am enjoying this discussion of stamps and Easter Seals, with tterrace’s observations and notes, and Dave’s hint of information yet to come (or to be teased out). I would like to add that I agree with tterrace on the OFB letter being incoming as opposed to outgoing. There is a visible postmark, square in shape, across the stamp closest to the envelope’s corner. Submitted by suecris on Thu, 06/26/2014 - 4:58pm. OK, that settles it - they're wearing the same brooch. Submitted by DonY on Wed, 06/25/2014 - 3:17pm. 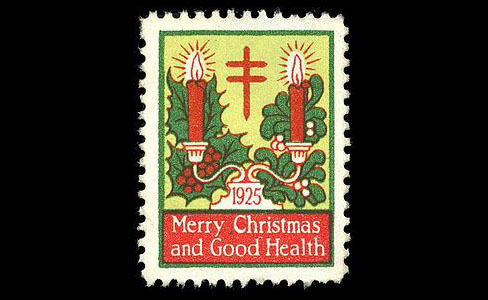 Those look like the 1925 Christmas seals put out by the National Tuberculosis Association. Submitted by Peter on Wed, 06/25/2014 - 1:51pm. The partly obscured book behind the telephone appears to be something about Robert "Fighting Bob" La Follette, the famous Senator from Wisconsin and champion of the Progressive political movement. He ran for president in 1924 and died just a few months prior to the apparent date of this photo. Coupled with the calendar from the Milwaukee insurance company, I'd say the book is pretty good evidence that this picture was taken in the Badger State. Submitted by rhhardin on Wed, 06/25/2014 - 12:41pm. The second letter down in the in box is from the Oak Flooring Bureau in Chicago. They're authors of "The Story of Oak Floors" (1924), a 24-page book. It has something to do with Wisconsin. Submitted by betabox on Wed, 06/25/2014 - 12:20pm. She has a calendar from a Milwaukee firm, and a copy of The Political Philosophy of Robert M. LaFollette (published 1920). Submitted by mgoldey on Wed, 06/25/2014 - 12:19pm. I think that the stamps may some sort of "Easter Seal" type of stamp, perhaps placed over the flap of the envelope to help seal it. Postage stamps at the time, if they came in sheets, had margins on each side, one of which would have had a plate number. Even if removed, the margins would have left a perforated edge instead of the straight edge shown here. They look like modern peel and stick stamps, by the Post Office didn't make those back then. Submitted by Hillary on Wed, 06/25/2014 - 9:43am. 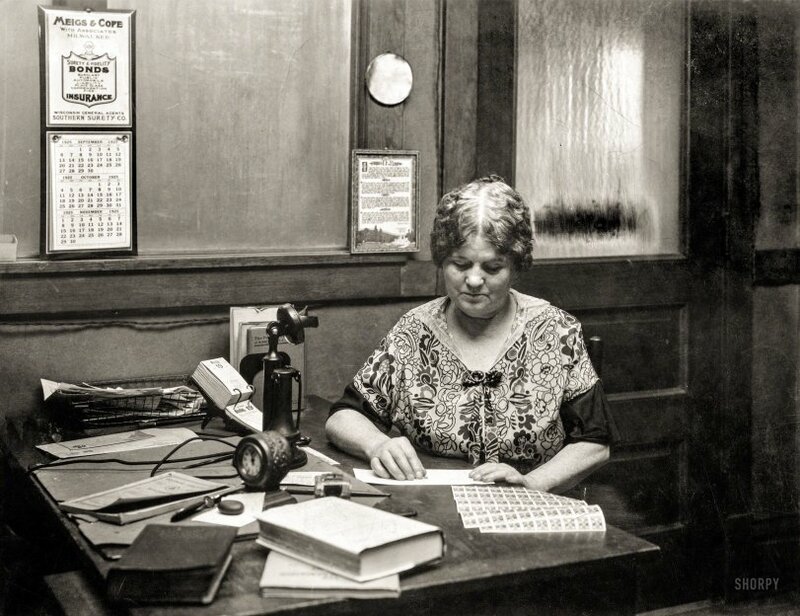 The return address on one of the envelopes on her desk reads Oak Flooring Bureau, Chicago. It's hard to say whether the stamps are cancelled, though, so we can't say whether the mail is outgoing or incoming and thus whether this photo shows the offices of the O.F.B.